It is my Grandma’s 94th birthday. The family, all 32 of us, are having afternoon tea, and grandma asked for gem scones. 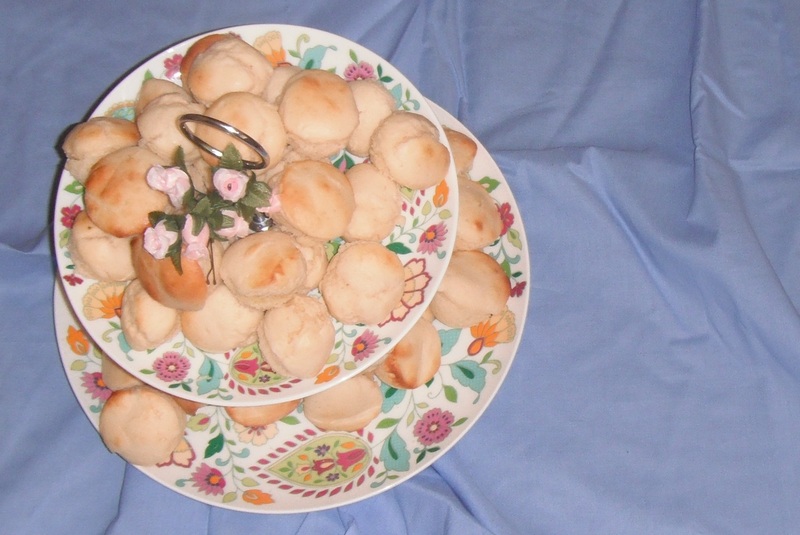 This is quite different to the previous traditional scone recipe I have posted. 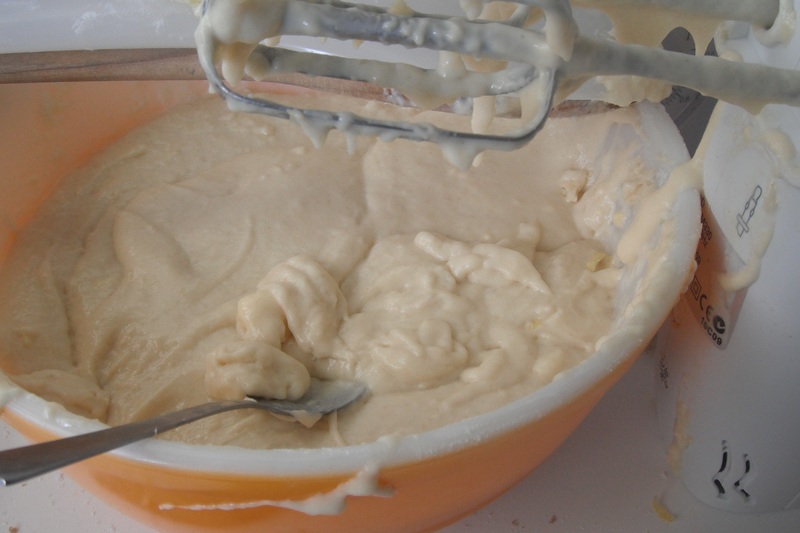 The batter is more the consistency of muffin batter than scone dough. Cream 60 g butter with 1/4 cup sugar, and mix in 1 egg. Alternately stir in 1 cup milk and 2 cups SR flour. Add some lemon peel or 1/2 tsp vanilla essence. Drop 1/4 tsp butter in gem moulds, then fill with batter. Bake at 200 ‘C for 10 minutes. A gem scone mould is similar to a cupcake tin, except the moulds are smaller and are completly round, ie without a flat bottom. They are hard to find, I used my mother’s. I’m sure you could use a mini-muffin/cupcake mould. Is the concept / name of ‘afternoon tea’ an English (thus Australian) thing? I never recall my American friends having afternoon tea. They would have a snack around 3pm certainly, but never afternoon tea, or morning tea for that matter. I also made a Jam Crown, and used a recipe from Fig Jam & Lime Cordial. I used sugar plum jam I had made a fortnight ago (is that another English word? I never hear American saying that one either…). The recipe for that jam will go up soon. I found the outside burned, and I wasn’t using fan force, due to the sugar. Watch for that. I also glazed the whole thing with some watered down jam, but that was mostly to cover up the burnt tasting bits! The boy was asking if I’d make hot cross buns for Easter so that’s perfect. Thanks. Gem Scones were a specialty of grandmother (who died when she was 93 – 15 years ago) – I have no idea what happened to her pan but I see them every now and then in “ye olde shoppes”. They aren’t as well known as pikelets and traditional scones are they – so I was tickled to see your post pop us. Glad to bring some nostalgia. No they’re not common, and Grandma was disappointed I didn’t have her sister’s recipe but they did go down a treat for those who’d never had them before. I’ll definately be picking up a pan if I ever see one, just in case. Haha yes, but I have just got a place three streets from my mum, so I will be stealing hers quite frequently! Hi there, does anyone here have a recipe for pumkin gem scones??? Apparently it is a recipe for Halloween??? Cream butter and sugar. Stir in pumpkin and egg. Sift in flour and salt. Mix with milk gently. Don’t over mix. Roll out lightly. cut into scones. Place on tray spaced apart, back in 220 degree celcius oven for 15 minutes. Not a ‘halloween’ recipe… My aussie grandma used to make them… But shouuld work for you.